Shaft Service Kit for OMC Stringer Sterndrive Low Profile Models. One kit to do it all! The shafts are new and in excellent condition but MAY have one imperfection where it appears the supplier may have removed a logo or identification number. This will not affect the function of the shafts in ANY WAY. Bearing Carrier Driveshaft (replaces OMC 909121). Short Water Pump Shaft (replaces OMC 909753). Upper Unit Seal Kit (replaces OMC 982949). 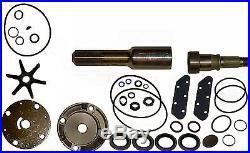 Water Pump Kit with Housing for (replaces OMC 983218). It will service the follwing OMC stringer sterndrive models. 175, 190 and 235 HP Low Profile 1977. 185 HP 1978 and 1980-81. WE NOW PROVIDE BULK DEALER AND INDUSTRY MECHANIC DISCOUNTS! Check out my other items. Compare to 18-2183 18-2185 18-3386 18-2667 22410 22412 12190 87650. The item "Shaft Kit Water Pump Kit for OMC Stringer replaces 909121 909753 982949 983218" is in sale since Wednesday, July 20, 2016. This item is in the category "eBay Motors\Parts & Accessories\Boat Parts\Outboard Engines & Components\Lower Unit Components". The seller is "dgmarine_123" and is located in Houston, Texas. This item can be shipped worldwide.